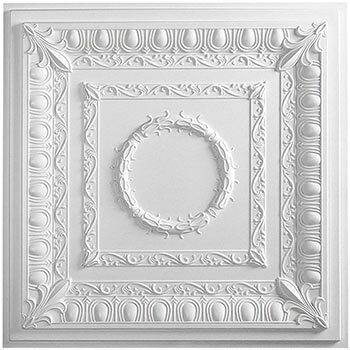 The Regal tile is an elegant choice for any space you want to add a little "wow". It is well suited for direct mount or grid application. At .03" thick, it is twice is thick as some of our other tiles. Since your ceiling will more than likely have partial tiles at the perimeter, you will have to cut your tiles to size for those areas. Since the Regal style projects 5/8", this will create a noticeable gap running into the wall. Our Designer Border Tile is the perfect remedy for avoiding this dilemma. We ordered these tiles to redo my pizzeria. The overall appearance looks beautiful. Our customers love the new look. We couldn’t be happier with it. Thank you for the great quality and excellent customer service. Exquisite look for the price! Excellent service. This went into an executive office and really “spiffed” it up!! Fast efficient service. Choose Regal white and Antique Bronze to finish a basement renovation. I choose the direct mount track and also added clips to help hold the tiles. Project went well and it looks great. Choose this over Sheetrock or plaster to upgrade the look of the room. First time with the product and would use it again. An extremely well made product! Easy to install - what a difference these tiles made to our basement bar area. I'm so glad I found and purchased these tiles through procielingtiles.com. Looks as good as much more expensive alternatives. Not yet installed but I've used a plain white similar tile in a non standard way. Great effect, light weight and easy to work with. Good service, good quality. Really jazzed up my kitchen ceiling. Once installed the room will look like a 5 star hotel. It is easier installed with the surface mount. Do not attempt to glue. It will be harder to hold up in place due to the decor in the tile. We installed these ceiling tiles in a small office in our home while we were doing some remodeling. They add so much character and beauty to the space! Although recommended, we didn't use any border tile and were very happy we didn't. Easy to install. So very happy with our purchase!! I am so impressed with this product- very easy to install and most important- it looks great! The tile panels can be cut with scissors to house the light fixtures. The ordering process was easy and the tiles arrived in a week. I will be ordering more from this site in the future. 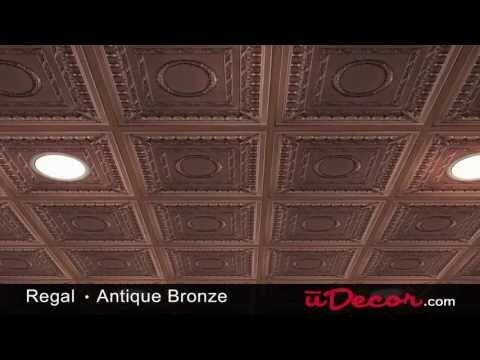 Installed ceiling in basement family room, bar, and game area of a large log cabin. There is detailed cabinetry in the bar, log walls in the family room, and a stone fireplace. The color and design of this tile fits the area very well. Everyone comments how beautiful my ceiling is. I have an older house, so we put this up in the kitchen and it totally changed the room. I love the idea that this is moisture proof since my upstairs plumbing is accessed through my ceiling. I now don't have to worry about tearing out another ceiling if we have any problems. More than just satisfied. Tiles are beautiful. I LOVE my salon ceiling! Everyone who walks in comments how amazing it is. It’s professional and clean looking. We have opened an up scale shoe salon and used to drop ceiling with these tiles and a beautiful crystal chandelier. Everyone loves it. It’s fabulous. I like this ceiling tile. It looks very good quality. Fast delivery. I would like recommand to others. Easy to put up, looks great anywhere. The best thing is it is relatively inexpensive compared to real tin. The company is very helpful and speaking to them always helped. Used the direct mount track and regal white panels in a basement remodeling. Came out well. Looks good. Fairly easy to work with. I am satisfied. And customer service is exceptional . Product fine, receipt condition of product poor. Several tiles received were cracked or broken on the corners. (At least 15). Installation worked out since several had to be cut anyway. Great item for a quick upgrade to any room. 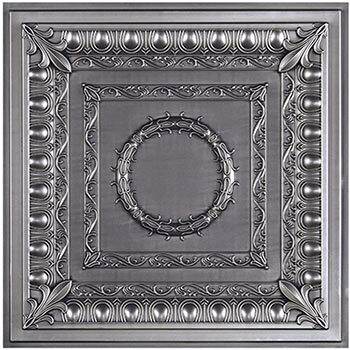 I'm using these tiles to make the interior of my room look victorian, and they work great. They are easy to install and easy to cut with tin snips if you need to cut out holes for lights or smoke detectors or anything. My only complaint is that they are brittle, so be careful not to drop them or they can easily crack/break. I'm very happy with the look in my kitchen area.I suggest the use contact cement or 3m adhesive your product not strong enough. Our feature wall looks great. It makes our bathroom, in our century home, look like it should. A classic turn of the century home. We will be buying more when we do the dinning room ceiling. Thank you very much. These tiles are not only beautiful but they have the look of the vintage tin ceiling tiles. Everyone asked us if they were original to our 1890 Queen Anne Victorian. And the price was excellent! We'll be back to get the grid strips to finish the look. Absolutely stunning! It's incredible the transformation this tile has made. My neighbor commented that she was watching a show on TV the other day of homes of the rich and famous. She said my ceiling looked like one of those in the mansions she saw on TV. It's hard to imagine just looking at the one tile but after you put them all up on the ceiling and add some molding, it's awesome! Great transformation at a great price! Love it! I was very pleased with the detail of this product. These look great. . . you will want to paint or stain to fit the application, but once done these look great. the tiles are great, I used them in a small portion of my basement, they were very easy to work with and cut very easy. I plan to finish a much larger portion of the basement and plan to use the tiles. They are also less expensive than the ones I can buy at the large discount stores and look much better. everyone loves it. This product made a drastic improvement to our house! Everyone notices how much better our ceilings look! I just love it and everyone who sees it does too. The hard part was finding an installer but I lucked out when I googled for one. we are extremely happy with these tiles. they were very easy to install and they look amazing in our living room. the price was unbeatable, these tiles were less than half the cost of any other ceiling tile along these lines, here in town. highly recommended. The tiles were easy to handle, stayed up fairly well (had a few we had to staple). The finished look is so nice we get comments on it all of the time. We hope to use the tiles in more rooms as we re-do the house. The ceilings were in very bad shape so this really helps us solve a problem in a relatively inexpensive way. These allowed me to make the formal dining room in my 1914 home look like it should within my budget. Gives it the country look that I was looking for, reminds me of my grandma's house. All who have seen it really like it!